SINGAPORE - When the distinctive baseline of Roy Orbison's Pretty Woman blasts out of the villa's speakers, it's my mother-in-law's cue to dance. She beckons the grandkids to join her and to my surprise, all five of them, aged eight to 14 years, oblige; each one being spun around in turn. The kids choose next, and Nana is soon grooving to Gangnam Style and snapping to Baby Shark, with raucous applause by us spectators. 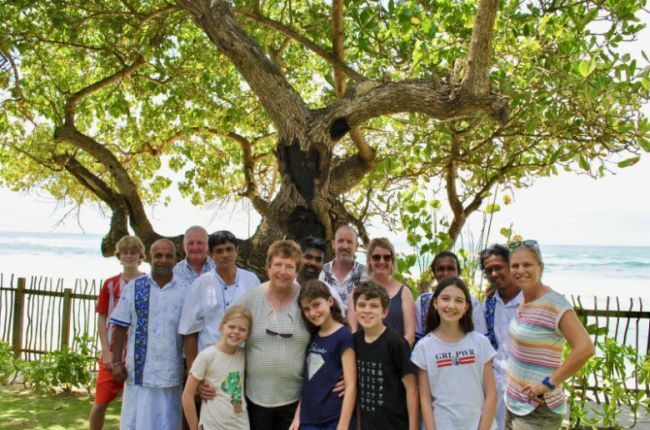 The fun of being together in a beautiful villa on a beach in Sri Lanka is intoxicating us all. "Why would you organise a trip for 10 people to Sri Lanka?" A friend had asked, as I prepared an itinerary for my parents-in-law, my sister-in-law and her two daughters (10 and 12 years old), plus my husband and kids aged eight, 12 and 14. I explained that I have always travelled with family and when I had my own kids, grandparents often joined our adventures. Travelling reconnects us, while still satisfying the wanderlust. It seems I am not alone. Worldwide travel network Virtuoso recently ranked multigenerational travel as the top travel style for 2019, a position it has held for several years. Mr Michael Londregan, managing director for Asia-Pacific and Global Strategy for Virtuoso, says that a combination of factors contributes to this trend. "People are busy; overdrive has become the de facto speed for everyone. Travelling to another place allows life to slow a bit." He continues: "Families learn together through shared experiences; they create memories, and all of it leads to better family conversations - before, during and especially, after the trip." Seniors are driving this trend too. With better health and with travel prices reducing, many seniors are sharing their bucket-list adventures with loved ones. Organising a trip to balance the needs of children and grandparents takes careful planning, so what should you consider? The first thing to decide is where to go. Two years ago my extended family visited Sri Lanka, covering ancient monuments and wild elephants in the cultural triangle and going to the sleepy east coast for snorkelling, surfing and Kumana National Park. The hill country offered tea plantations and a picturesque train journey. The trip was so great that my family chose to revisit Sri Lanka this year. It seems we are part of the cool crowd, with Sri Lanka recently ranked as the No.1 country to visit in 2019 by publishing group, Lonely Planet. The ranking acknowledges Sri Lanka's improved tourism infrastructure and general stability , 10 years since the end of its civil war. Factoring in the group's demographic, families need to decide on a holiday style: a road-trip, a "flop-and-drop", or both. This trip, we decide to base ourselves along the southern coastline, minimising our driving time. The next choice is between a hotel or a fully-staffed villa. Hotels can be handy for one-night stays, and in central and northern Sri Lanka, hotels are often the only option. Options in the more-touristy South are diverse, and we choose three different luxury villas. With a large group, villas offer good value compared with hotels. The main advantages of villas are privacy, communal areas for relaxing and the sheer decadence of being served by personal chefs and staff. I feel slightly smug, realising the villa choice is also fashionable, with data portal Statistica stating villa rentals across Asia are increasing by 18 percent per year. Our first villa experience is the beachfront Royal Indigo Villa in Talpe, which opens up to embrace the ocean, so close we can feel the salt spray. Kids dive into the infinity pool, before spending hours on a rope-swing hanging over the beach. In the mornings, we all stroll along the sand to a natural rock pool, watching fishermen dive in with a net, emerging with small flapping butterfish. Even the grandparents swim here, and kids crouch inside the rocky edge letting waves splash over them. Not having to choose a restaurant and wait for meals means the kids can play until their dinner is ready. Our chef, Janaka, recommends seared yellow-fin tuna with soba noodles, while the kids relish his prawn pasta. After the kids are in bed, the adults unwind with a nightcap under the stars. The staff offer priceless tips, suggesting lunch at nearby rural homestay Yoho Pahalagawattha. A gracious multi-generational Sri Lankan family welcomes three generations of our family for a delicious claypot lunch and my mother-in-law is even offered a cuddle of their three-month old baby. Villa Victoria (srilanka-villa.com) is our second beachfront stay, with architecture inspired by Geoffrey Bawa and a pool set in a vast lawn dotted with coconut trees. Lounging in the gazebo perched above the beach, we chat and watch sea turtles before sunset. Chef Anil suggests crabs for dinner and phones a fisherman who quickly arrives at our beach gate. Kids help select crabs and negotiate fair payment, and Chef Anil crafts an unforgettable Sri Lankan curry crab. Fifteen minutes inland from the busy coastal strip, Ivory House (srilanka-villa.com), our final stop, sits amid rice paddies and coconut groves in Koggala. Our van negotiates the pot-holed lane, and gates open to a gravel driveway that sweeps around a chicly-renovated plantation-style house. Kids delight in spotting shy, grey langur monkeys leaping through the treetops and chipmunks romping near the pool. Wild peacock calls accompany the sunset and our thoughts turn to dinner. Chef Sunil has travelled the world with Sri Lankan ambassadors and his whole baked fish is a highlight. For breakfast we choose Sri Lankan egg hoppers, a bowl-shaped, rice-flour crepe incorporating a soft-boiled egg, served with caramelised onion and chilli coconut sambal; or jam for the kids. On our final night together, my mother-in-law hands out mock awards for funny holiday incidents, amid protestations and laughter. We each nominate our favourite part of the trip; and for most of us, it was being able to share this experience with one another (except the younger kids, they liked dancing to Baby Shark). Before we have left the villa, we are planning next year's adventure.